Day 3 was a bit of a mixed day as far as which attractions we went on, as we hopped between the two parks throughout the day. 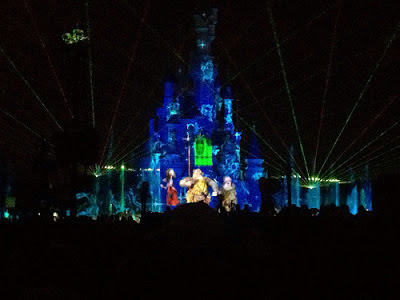 We had already taken advantage of Extra Magic Hours the previous day and we were going to do the same the day after, so we used Thursday as the opportunity to sleep in for a bit. 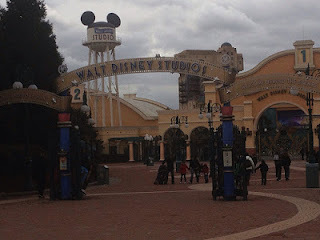 Nevertheless we made it to the gates of Walt Disney Studios Park for about 9:30am. Once we were through we headed immediately for Crush's Coaster as it was closed yesterday. The queue was huge already and there were probably about 150-200 people in front of us who had got there even earlier. Just before 10am they started letting people into the queue and onto the ride. We waited for about 20-25 minutes which was pretty good considering queues for the rest of the day always topped 60-90 minutes. The ride seemed gentler this time but the spinning really is luck of the draw. That was pretty much the only ride we wanted to do at that park for now, as we had done most the day before. We strategically knew that Disneyland Park would still have the shortest wait times early in the morning so we went on Big Thunder Mountain and Star Tours. 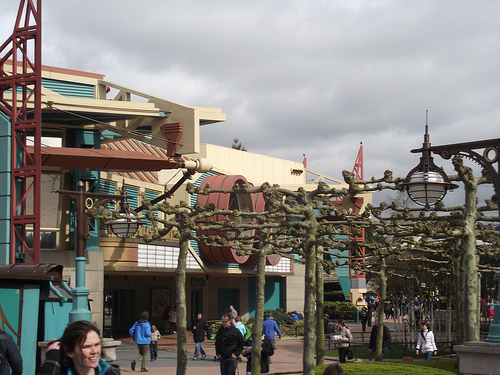 I enjoyed the odd shaped trees in Discoveryland. We also saw Darth Vader outside signing autographs and taking photos which I was very excited about. 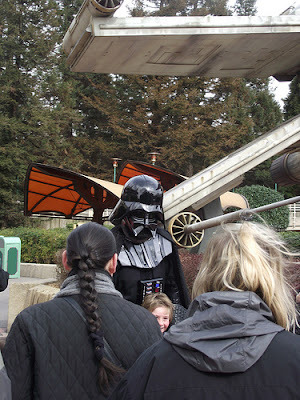 Had there been a proper queue I would have stood in it but those don't really exist at Disneyland Paris and I wasn't really going to fight some kids to get to Lord Vader. Then it was time for a spot of breakfast and we got 2 pain au chocolats from the Main St Bakery. These weren't great if I'm honest as they had nuts on them. 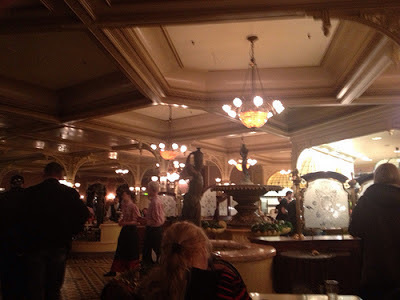 I also went to Plaza Gardens and got us a reservation for later that night as I'd never eaten in a buffet restaurant at Disneyland Paris before. Pirates of the Carribbean, Le Pays des Contes de Fees (no-one I knew was working that day unfortunately), it's a small world and Mad Hatter's Tea Cups came next. 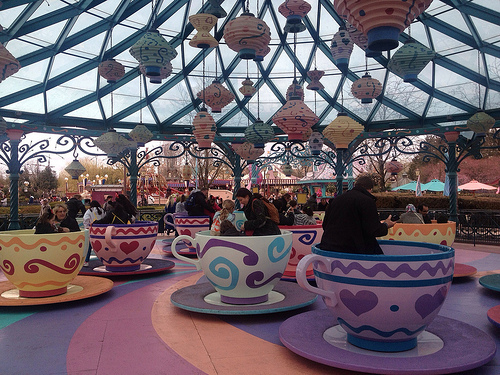 We then visited Alice's Labyrinth, rode Pinocchio, and rode Snow White. 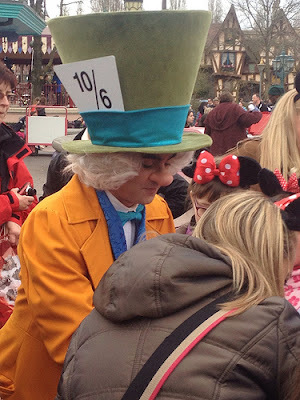 The characters were out in force in the parks and I thought the Mad Hatter was hilarious, though an English one would have been better. Tweedle Dum and Tweedle Dee were also there, as well as the Queen of Hearts. Then it was time for some late lunch. Neither of us were particularly hungry at 2pm. We went to the Pizzeria Bella Notte and ordered "giant" spaghetti bolognese. When it arrived I wasn't pleased at all - neither me nor my brother thought it looked "giant" - it looked tiny. We were starving by the point we got served, there were only 3 people in front of us and it must have easily taken half an hour to get some food! We sat down and the wonderful spaghetti bolognese I had remembered was horrible - it was runny and the sauce didn't taste very good at all. Admittedly last time I had it from Colonel Haiti's but surely it's the exact same recipe. Despite this I ate all mine easily and my brother was full from only half of his, so I ate the rest and I was then full. It's not great value for money, not great tasting but it was surprisingly filling for such a small portion. After lunch I showed my brother the upstairs of the castle and we went onto the balcony outside and got a good view from there. He'd never seen this and liked it a lot. It was also really cool looking round and seeing all the technical equipment on the castle for Disney Dreams - flamethrowers, all the cabling, pyrotechnics and more. It wasn't hugely visible at first sight but it is noticeable if you're looking for it while up at the top. My brother was also very excited to see the dragon under the castle, so I showed him that which was pretty cool too. 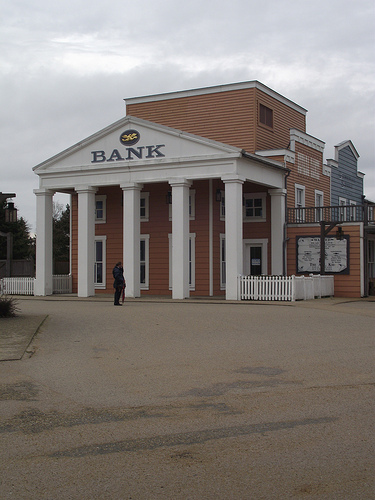 We then hopped over to the studios to visit a few attractions. We went on Stitch:Live which we'd never been on and was actually not bad at all. Though, we are reluctant to go bad as they do pick on people quite a lot. Some very cool technology though and Stitch's sniggering is hilarious, as well as some of his lines. 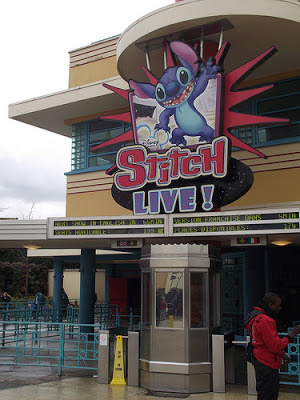 through the day at Stitch Live! There were lots of characters out here as well as I think the parade had just finished. 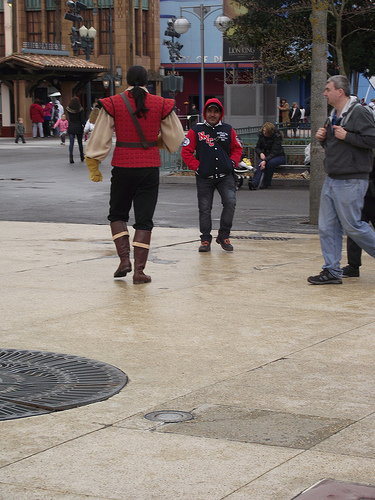 Gaston was very intimidating as he posed for photos with a couple of guys and shouted in a way Gaston would have. Gaston walking like a BOSS. My brother had never been on Armageddon: Les Effets Speciaux before so he was excited for that. It was a bit scarier than I remembered, especially when SPOLER: the floor drops twice. I think last time I had been holding onto a handrail but this time I was just in the middle of the platform. It's an incredible attraction though and the special effects are fantastic and they do truly make it feel like everything around you is going very, very wrong. Finally, we went over to the Art of Disney Animation and had a good look around. It is still a good attraction for a studios themed park but the most fascinating thing for me was the multi-plane camera in the first room used to make some of the original hand drawn Disney films - there's only 2 in the world. WOW! 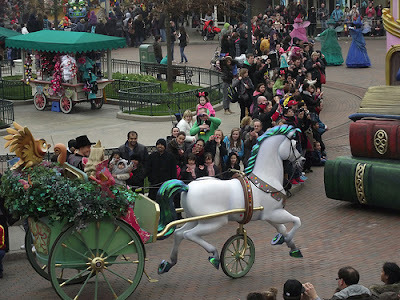 We then quickly went back to Disneyland Park and watched Disney Magic on Parade and then left the park again. but it was raining so we were dry! In my quest to do new things on this trip I wanted to visit all the resort hotels - most of which I had never been in or explored properly. The theming at the Disney hotels is great. We visited the Cheyenne first, followed by the Santa Fe hotel and made our way back via the Disneyland Hotel. Then, it was time for dinner at Plaza Gardens. I can honestly say that Plaza Gardens Restaurant and its buffet is by far the best meal I have had anywhere in Disneyland Paris. I will tell you now it is pricy at about 28 euros per person, but thankfully my shareholders card knocked 20% off the price which made it more bearable. The restaurant inside is beautiful and unlike anything I'd imagined. We walked in, told them the name of the reservation and paid at the till, then we waited for a couple of minutes to be seated. We were asked what we wanted to drink and were then given plates. The drinks came to the table and we were off to the buffet. The selection was great - I tried the pasta, meatballs, chicken, pizza, salmon, chips, steak burgers, and there were all kinds of other meats I normally wouldn't have tried. There were also salads, and rice and other meats and fish. I loaded up the plate until it was full - unfortunately I could only get two platefuls in which is unfortunate. The desserts were great too - try the chocolate mouse (it's pretty thick) with smarties, and the mini jellies are delicious. I would admit that it was rather busy but the food was always being replaced and it was warm, fresh and plentiful. I have heard since online that the do steaks here too - so it could be even better value. 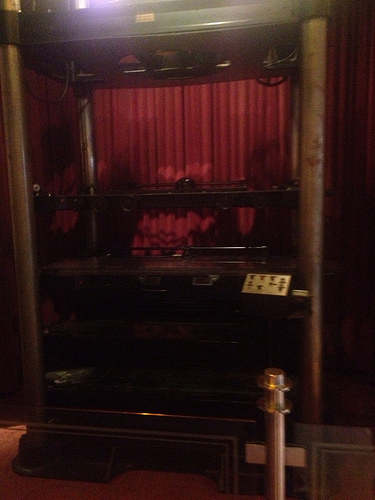 I would also like to note that our server was nowhere to be seen most of the time as he shied away and I had to ask for plates to be removed and for drinks refills on several occasions. I was also told that we couldn't fill drinks ourselves when I tried to get them filled and that our waiter had to do it for us, which makes no sense to me whatsoever. Apart from the service, which was inattentive, the atmosphere and the food itself was great. There was a birthday cake for someone whilst we were there too so it was nice to see the celebrations and the Cast Members really getting into it and singing. By far the best Disney meal I've ever had and I would go back. I just wish the prices were more reasonable for food across the resort. We still had a good 45 minutes after the meal before Disney dreams so we went over to Phantom Manor and rode that, then got a good spot on the hub for our second viewing of the show in as many days. We got home shattered. My iPhone which I'd set to track our walks said we had walked 16 kilometres that day. Wow! No wonder our feet were exhausted. It was a good night's sleep and we watched a bit of Alice in Wonderland on DVD to nod off. You can also read Day 1 of this trip report and Day 2.